Gecko roof: Scaffolding, plywood, fittings, climbers, SD video13min. Height 5.5m, L 7m, W 4m. 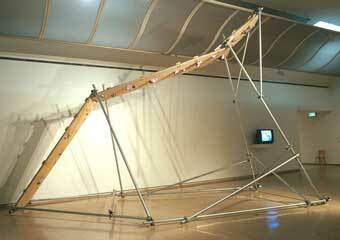 First shown Sydney Museum of Contemporary Art 2000. A large scale construction piece which emulates the famous (but now banned ) climbing route Clocks at Balls Head, Sydney. 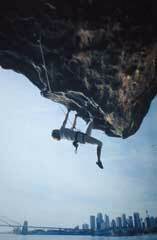 It is a hard climbing problem with a Australian climbing grade of 22 (UK6b). 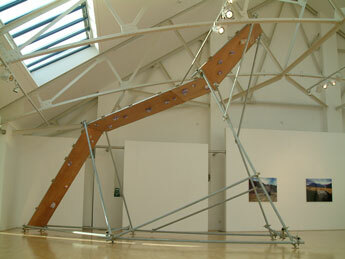 The structure emulates the roof crux section of the route. With assistance from the Sydney Rock Climbing Club, research into the Clocks route was based on climbing the route and analysing its’ holds, spatiality and move sequences. A basic structure to enable the height, elevation and aspect of the route was devised through model designs which were then developed to make the full scale structure. The holds were then attached according to the research to emulate the moves required to climb the original Clocks route. Once the construction was made in the gallery space local climbers, a great number from the Sydney Rock Climbing Club ( to whom I had given a lecture at their anniversary meal ) were able to come to the MCA gallery and climb the route. These climbing sessions were informally documented using a handheld video camera the footage edited to present an account of each climbers’ endeavours and the social interaction, in the form of encouragement, jokes and technical talk the route and work facilitated. The work engages climbers and non-climbers alike. Everyone to varying levels engages in mental projection of the looking at the route and contemplating the things that climbers think when viewing a route – Can I get up it? What sequence of moves? Am I strong, fit or agile enough? Would I have the commitment? What are the risks? Clocks was chosen because it is a noted route which in many ways represents an icon of climbing in Sydney and Australia. It is featured in many images where the Harbour Bridge and the city of Sydney appear as a backdrop and made famous by important climbers ( eg. Catherine Destiville by Simon Carter - image below. ). The fact that it is banned also made it pertinent to reproduce it in a museum – to archive an otherwise un-accessable (legally) landscape. The issue of access is a crucial part of the climbers landscape but in wider terms it may represent an important debate as to the right of access (symbolic and physical) to public/private landscape in Australia for all people. The piece re-constructs a spatial place and represents a landscape based on social consensus through the endeavours of a group of climbers focused around moves though space in a specific and arguably creative manner.